Do you know how to bulk shop with little to zero waste? 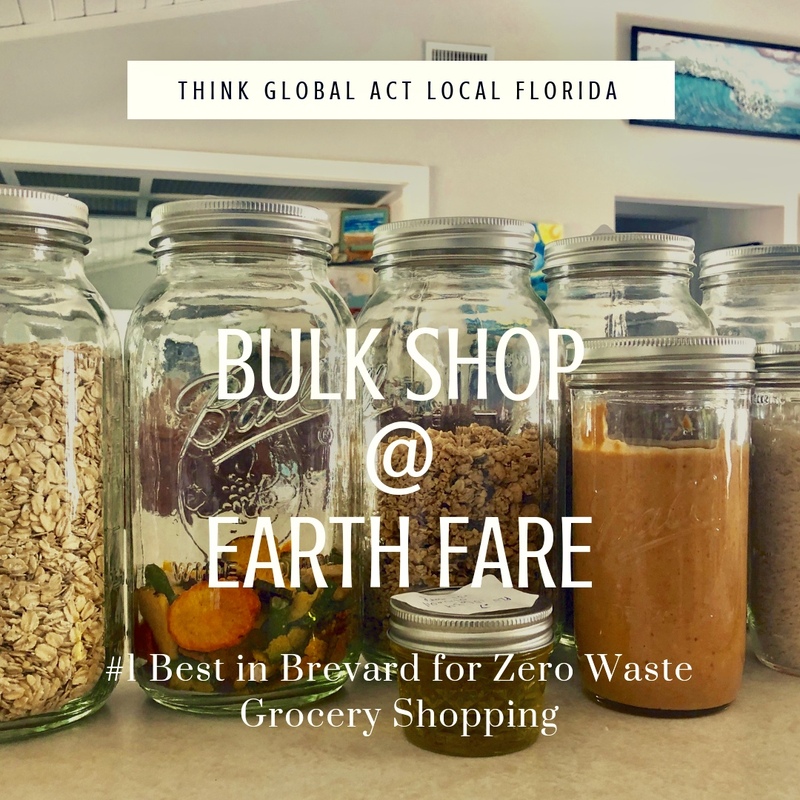 Have you been to the new Earth Fare grocery store in Viera, or any of the Earth Fare Markets throughout the USA, and looked at the bulk section and thought to yourself “ I would love to know HOW to bulk shop!” If so, then watch the video below and let us show you how! With such a huge plastic crisis that we have and recycling dilemma, now is the time, more than ever, to reduce our waste! Our landfills are growing and we are having to add new locations on all the time. Do you ever wonder to yourself what happens to the garbage I’m throwing into my can? I do believe if we all really watched the process and the end result we would do everything in our power to not create waste. Especially plastic waste! When I walk into a typical grocery store it looks like a place to purchase waste. There’s more packing and wrapping then there is food! There must be a different way because….. I have made a decision to not purchase garbage! It is not easy to purchase food without a lot of wrapping and packaging. And always plastic! It can be done and in my other videos on YouTube you can see me actually struggle and try to plastic free shop at places like Publix and Fresh Market. Which is pretty difficult but can be done! Number one rule stay off the isles! Items Needed to Get Ready To Bulk Shop…. 6 1/2 gallon mason jars holds things like oatmeal, flour, snack mixes and more. 4-6 24 oz big mouth Mason Jars these are a very practical size for things like rice, bulk peanut butter and beans. A favorite jar for me! 4 + Half pint mason jars great for bulk liquid like olive oil. As you Bulk shop more and more you will adapt to the size jars that work best for you. There are many other size mason jars that will work for your bulk shopping needs. These are my most used sizes. Produce Bags I use these great organic cotton mesh reusable bags for my produce. Also, I use Lock N Locks for my meat and cheese. If you dont have any containers for your meat and cheese than ask the butcher and deli to wrap your items in paper. The paper at Earth Fare can be composted for zero waste. How to Bulk shop zero waste. Watch the Video above. Here’s my recent shopping trip to Earth Fare. So I’ve gone to different grocery stores in my area and have made the decision that Earth Fare is by far superior in both bulk shopping and in zero waste shopping. I really appreciate their boot list of ingredients that they do not allow in the store. They worry about the ingredients so we don’t have to! All of their food is non-GMO and is very delicious and well purchased! The meat and seafood is the best I’ve ever had around here. And it’s a great price. For example I got fresh ground sirloin for $2.99 a pound! The produce is organic and affordable. We’re able to bulk shop for everything sustainable with mason jars and cotton bags! Which gives us the opportunity to shop plastic free!!! Subscribe and follow us and we will show you in this video and in upcoming videos how to Zero Waste grocery shop. I have now found my favorite place to shop in Brevard County! Earth Fare is definitely our county’s BEST! I can purchase food for a family of four for about 20% less than the amount that I spend at Publix. I don’t shop the isles for more than 1 or 2 things if at all. The isles always cost more. When I shop for a family of 4 zero waste I usually buy five different packs of meat wrapped in butchers paper. My vegetables without any wrap put in my own bags. Milk in returnable reusable glass jars, cheese in my own containers, bread from the bakery in my own bag and of course, everything else we need in the bulk section. Bulk items I purchase include flour, cereal granola, rice, all sorts of beans, nuts, corn meal, olive oil, honey, peanut butter and snacks of all sorts that are non-GMO and healthier including organic. The best part of the whole shopping experience at Earth Fare is we are not buying a bunch of plastic waste thus we’re helping to save our environment by reducing our carbon footprint, reducing waste! Be sure to come back and see more videos of us shopping at Earth fare. I will be going there next week to video more bulk shopping with help so we can get even more bulk shopping in action ! Today I was out running some errands and I saw a Fresh market in Suntree Florida. So I stopped in unprepared with only a bag and one jar. In spite of forgetting my to go bag full of all of my necessary zero waste shopping items, I was still determined to try to grab a few things without plastic and to check out the Fresh Market grocery store. It’s really quite a lovely grocery store. I hope someday that they will carry less plastic items. But I hope that is the future of all of our stores! When I walk into a local store I see waste that eventually goes to a landfill. What do you see? Think about that as you look around on your next visit to a local store. It’s always interesting to imagine how people are going to respond to you when you ask them for things in your own containers or even more interesting is asking them for no plastic. Some people respond well some people do not. Some people are interested and some people have some great tips and information! It’s so worth while to build community and another reason why zero waste shopping is a great benefit! I was able to get meat and cheese without plastic. Also got some great advice from the butcher about using a local Butcher to cut your meat versus a commercial grocery store. Highly recommend that you check into methods and practices of your local grocery store and opt for a butcher cutting your meat. I was able to Purchase my bread and put it in my own reusable bag. Although it was strange to them because they had never done this before. The bakers didn’t really know what to do so I said “just hand me a loaf of French bread and print out a label for me!” Although hesitant they did what I asked! All in all Fresh Market is s nice grocery store with a lot of availability to shop minimal to waste free. The prices are a bit higher but it is a quality store. It’s a very interesting journey learning how to Zero Waste shop. I Can definitely see this becoming more and more popular as people learn about it. Please share this great philosophy, watch our videos and follow us on our journey!